The United States Mint in 2015 was the busiest it’s been in 14 years, with demand for coins so high it expanded operations and hired more people to fulfill coinage orders from the Federal Reserve. The agency produced more than 17 billion coins for circulation in 2015, marking a sixth straight year of growth and the quickest annual pace since 19.4 billion coins were struck in 2001. U.S. Mint production facilities in Denver and Philadelphia shipped 17,046,700,000 coins to Fed banks for distribution into the economy last year. That’s 28.4% higher than the nearly 13.3 billion coins minted for commerce in 2014 and 380.5% more than when mintages bottomed out in 2009 to just over 3.5 billion coins. Quarters led year-over-year gains with almost 3 billion made, advancing 89.3% from 2014. Nickels and dimes followed as each climbed about 32% from the previous year. The U.S. Mint made good revenue with these coins since the cost to produce and distribute them is lower than their face values. Unit costs are 8.1 cents for each nickel, 3.9 cents for each dime and 9 cents for each quarter, according to the latest available Mint annual report (2014). When looking at the above table, keep in mind that Presidential $1 Coins, Native American $1 Coins and Kennedy half-dollars are no longer produced for circulation — Federal Reserve Banks do not order them. 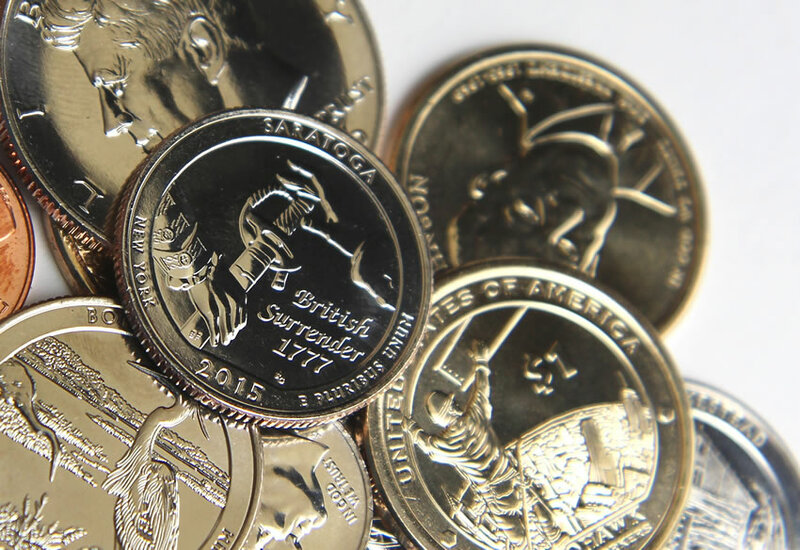 The U.S. Mint now strikes them in smaller quantities and they are only available in products for coin collectors. All U.S. coins for circulation originate from either the Denver Mint or Philadelphia Mint. Last year, the facility in Denver struck over 8.6 billion coins while the one in Philadelphia produced more than 8.4 billion coins. In unit totals, Lincoln cents easily won among denominations with more than 9.3 billion made, representing 54.9% of the year’s production total. Ironically, it costs the Mint 1.7 cents to strike and distribute each one, so the most made U.S. coin is actually a money-loser. Mintages of Presidential $1 Coins reached just over 40.3 million in 2015, up 14.8% from the total of 35.1 million dollars in 2014 and the highest since 44 million were produced in 2012. There were two corrections made in December with total trimmings of Philadelphia Mint quarters and Denver Mint Presidential $1 Coins. Coin production figures in this coin news article are based on data aggregated from the U.S. Mint webpage at: http://www.usmint.gov/about_the_mint/?action=ProductionFigures. Thanks Mike for the nice review of coin production and costs. According to my math the mint lost $65M minting the cent and $48M minting the nickel. They made $185M on the dime and $480M on the quarter so they still ended up way ahead. I still can’t understand why we just don’t drop the cent entirely like Canada did. The nickel makes sense because of the retooling cost for vending machines, but no one would miss the cent. They could cease production of the nickel, but it would also entail ceasing production on the quarter-dollar in favor of the half dollar which, for some reason, the public will not allow. An alternative would be to eliminate the cent, nickel, AND dime to reflect inflation’s impact on the dollar but that’s also not going to happen. When Britain “went decimal” they started with 10p and 50p coins but didn’t have an intermediate denomination. Half-pounds circulated widely but people were so fed up with using handfuls of 10p coins that the Royal Mint had to create a 20p coin to simplify change-making. I was in London on the day the new coins entered circulation and you could almost feel the relief among shopkeepers. What about mintage numbers for the circulation-quality San Francisco quarters? That’d be nice to know for 2015 and for the otherwise comprehensive historic tally above.